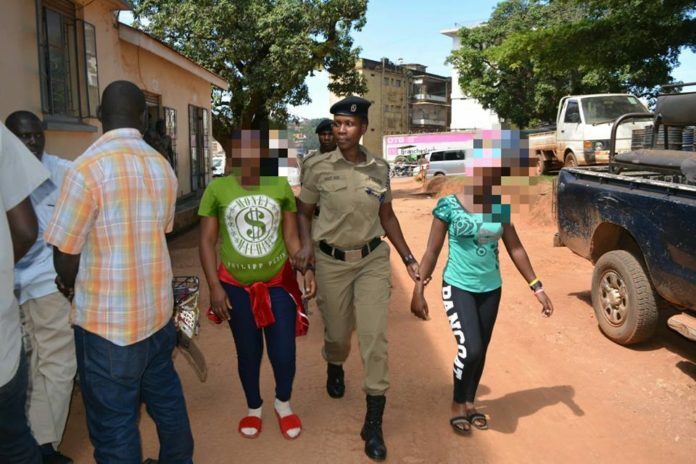 Two women Jackie Matovu and Aisha Nakiwala were on Tuesday arrested selling drugs to street kids in Kisenyi, a Kampala suburb. The duo were found with 23 litres of aviation fuel which has now been taken as exhibits. Their arrest follows a directive from Deputy IGP. Brigadier Muzeeyi Sabiti, on fighting drug cartels within the Kampala Metropolitan Area. The operation led by DPC Old Kampala Charles Nsaba also involving skilled undercover officers trailed and tracked the duo selling benzene (aviation fuel) to street kids. The kids sniff the benzene fuel to produce feelings of empowerment, self-esteem, euphoria and an unusual rush of energy. Such a state of mind becomes an impetus to these children to engage and in commit crimes like snatching property during traffic hours among others. Starting small, these children later graduate into more sophisticated criminal activities like murder. Upon questioning, the suspects told police that they oftenly recruit the children knowing they are likely to attract less suspicion and also work on the assumption that if they are caught they will be dealt with more lenience than adults. The suspects are currently detained at Old Kampala Police Station vide SD REF. 54/14/05/2018.